Eckert's has been making our famous caramel apples for years, and they are still available in our Country Store today! The reason that these caramel apples are so delicious starts with the fruit. Our Granny Smith variety of apples is the type of apples used to create this perfect dessert! Granny Smith apples are ideal for making caramel apples because they are a crisp apple and they stay firm for long periods of time. Another reason why we sue Granny Smith apples is because of their flavor! Granny Smith apples are very tart and that balances well with the rich, sweet caramel that the apple is dipped into. Having two rich full flavors balancing off one another like that creates an explosion of flavor in every bite! To prepare our delicious caramel apples there are a few steps we must take. First, our caramel is heated in a giant double broiler, and slowly stirred to create a smooth and creamy texture. We are sure to monitor the temperature of the caramel carefully so the caramel is never over heated or burned. As we are warming the caramel up to the correct temperature we begin the process of removing the stems from the freshly picked, tree-ripened, Granny Smith apples. We remove the stems from the apples because that is where we place the wooden skewers, which is our next step in the process. (Putting the apples on a stick allows us to dip the apples easily, and for you to eat the apple easily!) After the caramel is heated and the apples are skewered, we then dip the entire apple into the liquid caramel and roll the apple into the desired topping until it is evenly coated. We then allow the caramel to cool, and the topping to settle into place. Ta-da! Our famous caramel apples are finished and ready to eat! 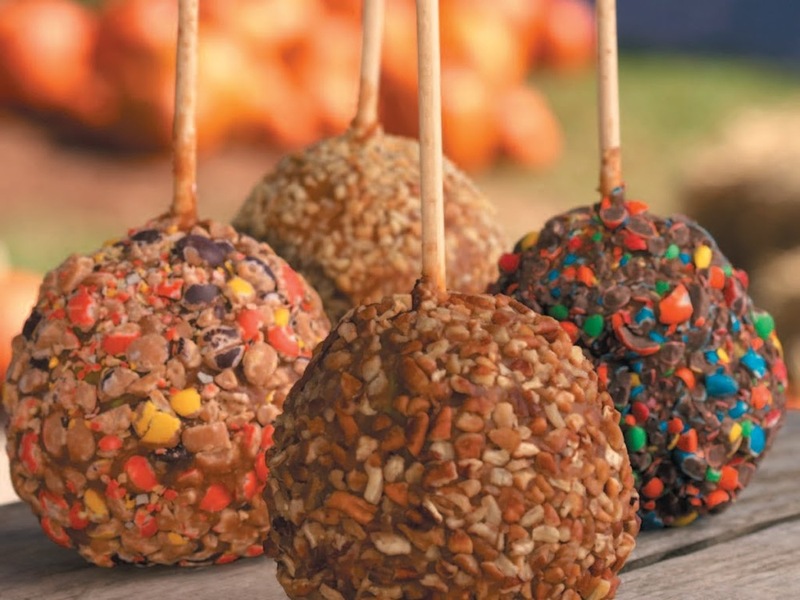 One unique thing about Eckert's caramel apples is that we have several different types of toppings that we can add to the mix. We have choices like crushed M&M's, Reese's Pieces, Peanuts, Pecans or Heath Bars. These toppings are sure to satisfy even the biggest sweet tooth! For those of you what enjoy a more traditional approach, we also provide the original caramel apples, where the apples have simply been dipped into caramel. With these options we are sure to have a caramel apple for everyone in the family! Caramel apples are only available during the Fall season here at Eckert's and are a staple of autumn everywhere. There is nothing better than the first sweet-tart bite into a fresh hand-dipped caramel apple!